Helping you sell or buy your next home and then enjoy it! Next trend in kitchen appliances after stainless steel? How about ice, glass or slate? September 5, 2012 — “Stainless fatigue” is what The Wall Street Journal this week called what may be a new design phase for kitchen appliances. If you’re planning on a kitchen makeover, which ad the privilege of working on for some of my clients moving into their next homes, you may want to heed the proclaimed end of stainless steel’s 25-year reign. That said, there does not appear to be clear successor in place. Here is how The Wall Street Journal sums up the looming challenge to stainless steel. How does ice, slate or glass strike you? What began when Viking Range Corp. launched its iconic stainless-steel open-burner range in 1987, now is motivating GE Appliances, Wolf Appliance and Whirlpool to manufacture and market the next ‘big thing’ for the maturing foodie culture in the U.S.
Haven’t we ‘been there and done that’? GE is playing its cards close to the vest. 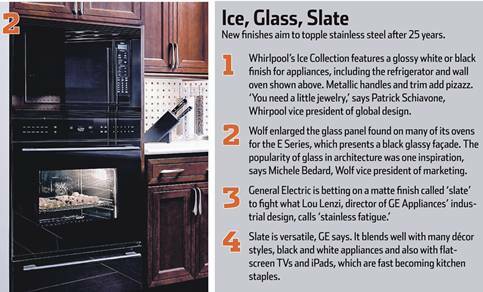 While “slate” is the new moniker for its appliances, a spokesperson would only tell the Journal its refrigerators, ovens and dishwashers would have muted gray design and a “metallic matte” finish. A common strategy may be to make appliances blend in in a tasteful way rather than stand out as trophies. Also, for more people, entertaining begins in the kitchen and increasingly never leaves it. In my home, the focus of entertainment rarely leaves the kitchen except on family holiday gatherings and Super Bowl parties. Maybe our beloved magnets will stick to the front of these new appliances, not just the single side that typically faces the counter. Early on that was communications-central in my kitchen. FYI: LG, for one, is sticking with stainless steel. With inventory low and demand rising, how much is your home worth?